Another day of Meet the Teacher week. This week we are sharing about teacher schedules, planning and management. I honestly believe that effective planning and management is the vital ROOT of a successful school year. 1. Looking at my social studies and science standards and assigning them to individual months as overlying themes. 3. Type it all up so that I can see the WHOLE year at once. 4. In addition to my personal copy, I print a huge poster-sized copy for my team and our RSP teachers to refer to as well. Please visit this post for a whole lot of information about backwards planning and curriculum mapping. Clean Up and go home. Click the image to read more about my weekly planner. While I understand the desire to paper and FLAIR pen plan, I LOVE digital planning even more. And, yes I do love colorful pens, doodling and highlighting, but I love colorful, fun fonts even more! Another reason I enjoy digital planning is my strong desire to have all of my plans on my computer and at my fingertips wherever I go. Although I enjoy change, last year’s plans are a nice starting place for the current year. Digital planning allows me to always have my routine items built into my plans and save me a ton of time, because all I have to do is add the little daily changes. I think second to year planning is workload management. I stick to a pretty simple routine. 1. Copy/prep a month at a time. 2. Plan on Thursday for the following week. Put all items in folders labeled for each day of the week. If it isn’t ready to go by Thursday the week before – save it for another week. No reason to stress. 3. Have ONE “to do” stack/pile/tub. Pick a day each week to go through it and put things away and get things done. Speaking of the folders mentioned in #2, do you use them? We call them MondayTuesdayWednesday folders… just like that – obviously saying MondayTuesdayWednesdayThursdayFriday would just take to long. 😉 I put all of the work to be done in these folders on Thursday afternoon (I slide Friday’s in at the end of the day on Friday). I use one of those huge paperclips to clip my plans to the top each day. The folders could easily last for years after laminating. But sometimes I like to change up the look with the different daily labels. These are the different labels for I’ve used over the years. 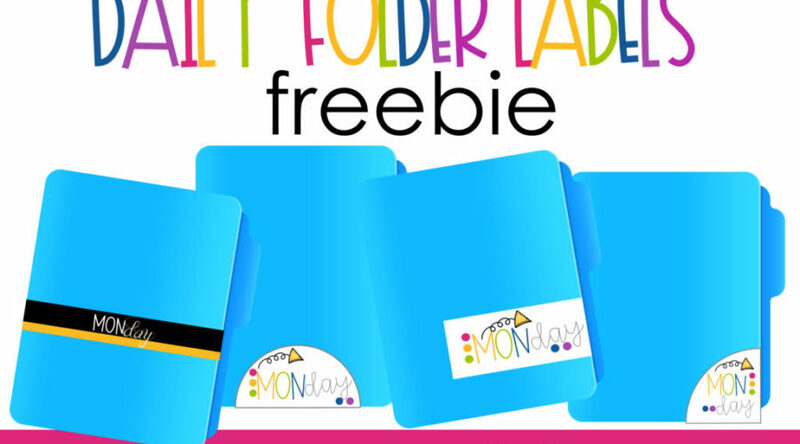 Grab these Daily Folder Labels here! Be sure you hop over to Blog Hoppin’ to check out the other planning and management posts. I’m curious, what’s your biggest planning/management obstacle? I love the idea of being so organized and having a plan yearly. As I came into the school later in the first term I wasn't able to do it this year. Hopefully next year I can get this started.